RAWR! This year I decided to be a dinosaur for Halloween so I could spend the entire night RAWRING! 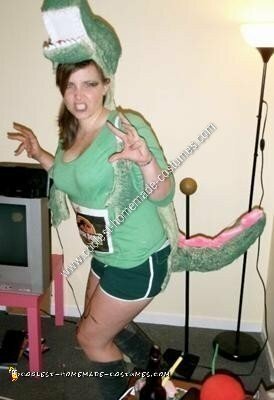 I didn’t buy a single thing to make this Woman’s T-Rex Dinosaur Costume but instead had it lying around the house. Step one: to make the shape of the mouth I used a plastic container, the mouth is a plastic container lid, the head was a fabric container in a square shape. Then using packaging tape and plastic bags I created the round head. I then glue gunned down a green towel around the shaped head. NOW YOU HAVE A HEAD! Step two: the mouth I lined with white fabric and used red fabric for a tongue. The teeth I cut out of small Styrofoam balls. The eyes are the same Styrofoam balls. Step Three: to make the tail using the same towel I glue gunned the shape of the tail together then I used a wire hanger to make it stand up straight then stuffed the tail with newspaper. Step Four: using the towel again I made it run down my back to my bum, and glue gunned on elastic bans to go around my arms and waist. Step Five: to make the spike I glue gunned the shape out of white fabric and stuff it with plastic bags. Then spray painted them pink. I then painted the entire thing a darker green to make it scarier. Just for a added touch I printed off a Jurassic Park Sign and Wrote “Property of” on it. The costume was SO MUCH FUN! and everyone loved it. It took about 6 hours to make. You need 2 full green towels and a lot of glue sticks! Good Luck and Happy Costume Making !